he Astroblepidae family is little known as they prefer cool water and are not kept very often in the hobby due to their exact requirements. But nonetheless they are very interesting especially in their climbing habits. Fishes of the family Astroblepidae (and its one valid genus Astroblepus Humboldt, 1805) are found in freshwaters streams (between 200 to 13,400 feet above sea level) of the tropical Andes from Panama to Bolivia, and occur in both the western Pacific and eastern Amazonian slope drainage systems in South and Central America. Astroblepids are closely related to the Loricariids, and in fact one genus of fish (Lithogenes Eigenman, 1909) seems intermediate between the two families, having the shape and form of an Astroblepid, but some plates on the body and other morphological characters closer to Loricariids. Astroblepids are distinguished from loricariids by the naked body, which is covered by bony plates in loricariids. At the time of writing, Lithogenes is currently placed in Loricariidae. The images above were taken by myself in the field at an altitude of 1471m and a water temperature of 15.6C (60.1F). We found Astroblepus in the Madre De Dios region between 443m (1453ft) to 1471m (4826ft) high but never below 443m. 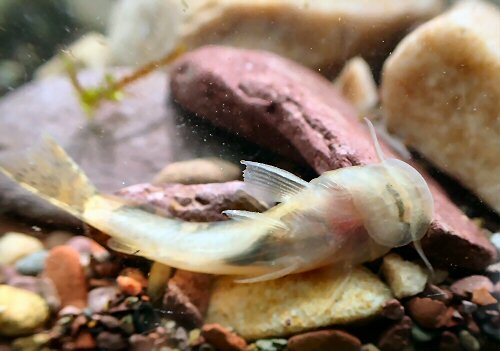 All species of Astroblepus feed on Aufwuchs which is why they are problematic to keep in the aquarium for any length of time. The structure of their mouth and teeth reminds one strongly of loricariids. Astroblepus are adopted perfectly to strong current. They do not have only a suckermouth, but also a moveable adhesive apparatus on the belly. Both specializations allow the fish to climb even over the strongest rapids existing. On the upper edge of the opercula is a small aperture that allows the fish to breath even although the mouth is attached to the ground. There are at present (April 2019) 67 species in the Astroblepus genera. Remarks: This species may be A. mancoi or a very close relative. The family Astroblepidae have the head and body depressed, flattened and not covered by an armour of dermal scutes. Two pairs of barbels, one maxillary and one nasal. The dorsal fin is short with 6 to 7 rays that is provided with a stout spine. An adipose fin is either present or absent and when present it is often long and low with a stout spine. The mouth is inferior, with the lips expanded and forming a sucker. Dark brown body colour with yellowish vertical bands. Caudal fin outer rays with brown and yellow bands. Dorsal fin clear with hard ray sporting brown and yellow bands. 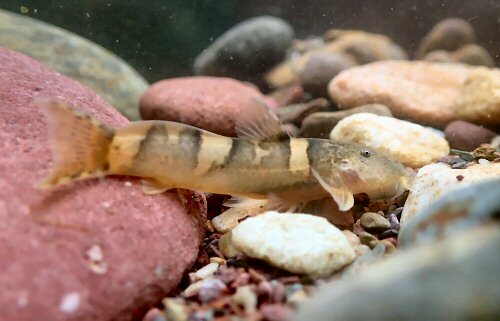 Not an easy family of catfishes to keep as they would have to have a large tank with rocks and some appropriate vegetation. The water would need to be fast flowing and provided with extra oxygen via an air tube fed into the powerhead flow. The tank should be set up with rocks so as to provide an area where the water current will be slower. Any fast water fishes that are used to cooler water temperatures. Males have an elongate urogenital papilla that apparently functions as an intromittent organ. Invertebrates, insect larvae, spirulina tablets or paste, algae based foods and live bloodworm would probably be the staple diet but you may wish to try glassworm and blackworm (although these won’t tend to stay on the substrate unless the current takes them there). Dorsal fin: The primary rayed fin(s) on top of the body. Maxillary barbels: Pertaining to the upper jaw (maxillary barbels). Nasal barbels: On top of the head, by the nostrils. (nasal barbels). Opercula: The bony covering of the gills of fishes. Astroblepus: Astron = star; blepos = look. 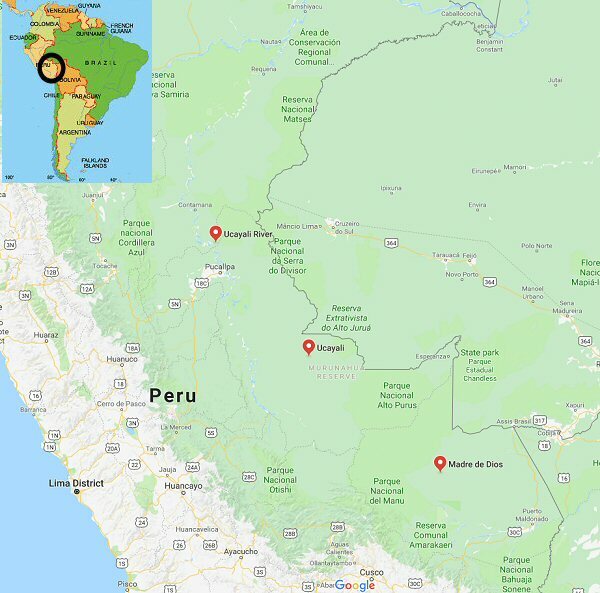 South America: Upper Ucayali River basin and the Madre De Dios region Peru. Type locality: le haut, Peru.